China's Manufacturing Economy in Recession? Bloomberg is reporting China's Manufacturing Contracts for Second Month . Manufacturing in China, the world's fastest-growing major economy, contracted for a second straight month in August, according to a survey of purchasing managers. The Purchasing Managers' Index was a seasonally adjusted 48.4, unchanged from July, the China Federation of Logistics and Purchasing said today in an e-mailed statement. Since July, Chinese policy makers have put extra emphasis on sustaining the economy's expansion rather than cooling inflation. Growth has slowed for four quarters and Vice Commerce Minister Gao Hucheng said last week that weakness in global demand will weigh on China's exports for the rest of the year. "This suggests economic growth will continue to slow," said Sun Mingchun, an economist at Lehman Brothers Holdings Inc. in Hong Kong. The output index rose to 48.7 in August from 47.4 in July, while the index of new orders fell to 46 from 46.2. The index of export orders climbed to 48.4 from 46.7. The index of input prices dropped to 57.8 from 71.3, "which may mean that producer prices have already reached a peak," said Lehman's Sun. While everyone points to economic trouble both here and in Europe, I haven't heard many talking about the Chinese economy. I hear a lot about their stock market, but not much about the Chinese Purchasing Managers Index, which is plunging into negative (contraction) territory. This is likely as much behind the fall in oil as Gustav not being as nasty as many think. So the recession is now most likely global. Stocks can stay bid for a while, but be careful, folks. Prices are likely to be very technical and thin. On other boards I am reading, many are anticipating a huge jump in oil and gas prices next week. I do not know if that will happen, but I will offer the opinion that if it does not happen, or if it happens and prices quickly reverse lower, they will keep going a lot lower than most energy bulls think. Short to intermediate term, it is highly likely that the slowing global economy will have far more effect on energy prices than peak oil. Gustav was not as severe as expected and China is contracting. Those are pretty strong reasons to expect crude to be dropping today. In this case, the long term implications of China slowing are far more important than news on Gustav. China is now in recession using the Purchasing Managers' Index as a guide instead of GDP. 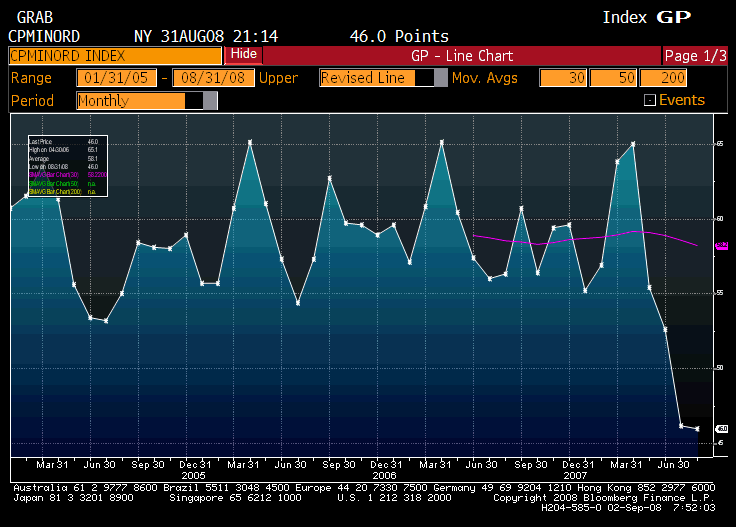 I do not think much of GDP statistics in the US (see GDP Much Weaker Than Headline Numbers ). And I do not think much of GDP statistics when it comes to China either. Please see Is China's Growth Story Coming Unglued? for reasons to question China's GDP. Peak oil or not, there are plenty of reasons for crude prices to be dropping. Add contracting manufacturing in China to that list of reasons. Yet, in spite of short term and long term news that supportive of the idea that crude prices should drop, there were screams of oil manipulation on boards I follow this morning. More and more, any commodity price that moves lower is met with screams of manipulation even as a fundamental case was made for a strengthening dollar and a rapidly slowing global economy. 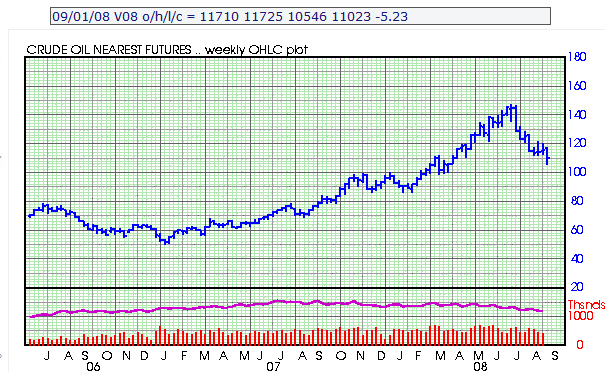 The above chart is courtesy of Barchart . Support is at 100. One might be looking for a bounce there. If it comes, I doubt it holds. The slowing global economy is starting to take its toll.